Bosch Fontus Review - What It Is, What It Does, Is It Worth It, + Much More! 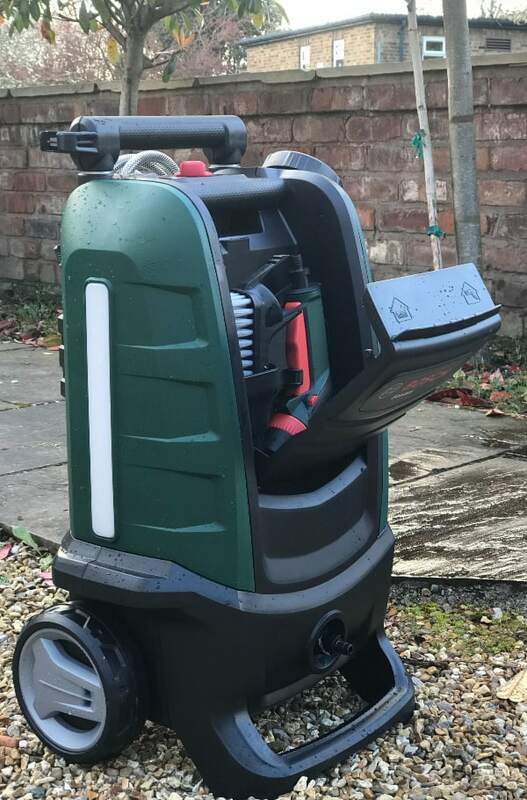 Review of the Bosch Fontus Cordless Outdoor Cleaner. In this post I will go through what it is, how to use it, its positives and negatives – and loads more. You will be able to clearly see whether it will solve a problem in your own home, and I can’t wait to see what you think! I would like to thank Bosch Home and Garden for collaborating with me on this review. I was paid for my time, but as always, you can be assured that all words and opinions are my own. I only agree to working with brands I love and use myself – and will only ever share their products with you if I’d recommend them to a friend. This is something that fills a need we have in our house that I didn’t think existed on the market, so I was over the moon to find out it did! You see, our house has no way to access the back from the front, apart from through the house. There’s no side access at all. It’s not a terraced house, but I can empathise with you if you live in a home without access like this, because it’s a real pain and frustrating to say the least. You don’t realise how much you need it until you live without it! The obvious issues with this are when we need to do messy/dirty outside work in the back, and need to take things away. It’s bad enough walking several loads of grass cuttings through the house when we mow the lawn, but I won’t even get started on dragging trees through the house to plant, or taking huge chunks of tree away when one had to be felled a few years ago for fear of it falling into the house (Yes, it’s fun living with us!)…. But the less obvious issue that crops up, that you don’t even think about until you need it, is access at the front of the house. Of course, WE can get to the front of the house – but we struggle with getting one specific thing there, and that’s water! After a muddy run, to hose down shoes and even our legs before we walk into the house (well, my hubbys specifically because I am SURE he runs through mud that’s thigh deep for fun when he goes out!). … and without a water supply these things are pretty much impossible – so we live with muddy stuff, and end up paying to get the cars washed elsewhere. 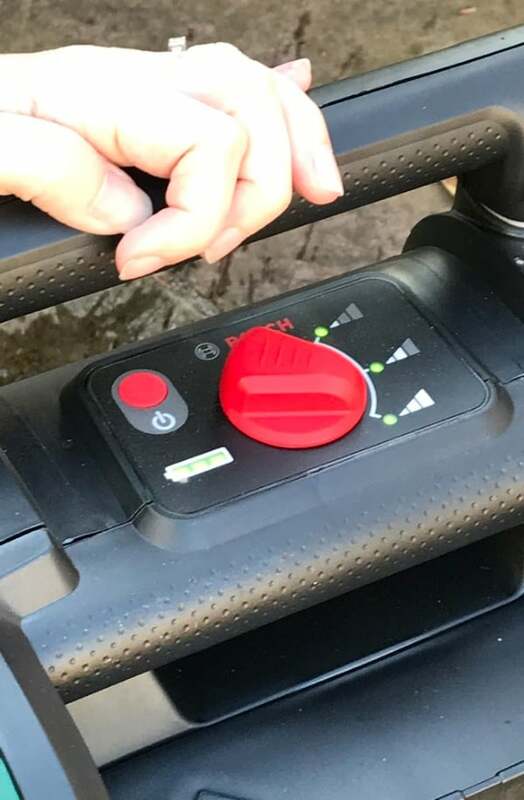 SO – when Bosch showed me the Fontus, I was crazy pleased that there was a potential solution to this issue – and I waited for it to arrive so I could test it out and see if it was all I thought it could be. WHAT DOES THE FONTUS DO? It’s a cordless outdoor cleaner, that you can fill with 15 litres of water, and use anywhere outside to clean stuff. 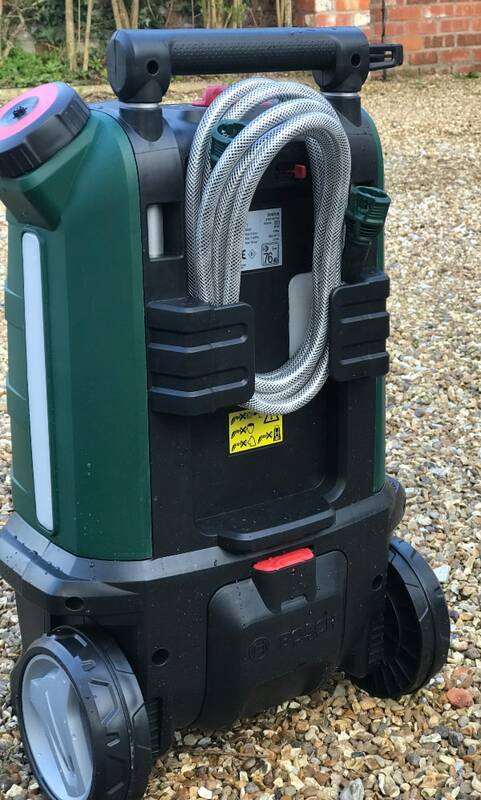 It has an integrated 4 metre hose, 3 different pressures for different cleaning needs, 4 different water jet choices, and various attachments so is very versatile and can help clean all sorts of things where a hose and water isn’t available. After a muddy walk you can clean everything before getting back into the car – from your shoes, to a pushchair, even your dog! Clean the outside of the house – windows, window sills etc…. STEP #3 – Choose the attachment and the pressure you need (The pressure is the dial on the right). STEP #4 – Get to work! WHAT’S GREAT ABOUT THE FONTUS? You can now have water where you need it – along with pressure and the ability to clean things! #1 – It’s not a power washer – as the pressure is still quite low. BUT it never promises that it CAN do this though, as power washers need a steady water flow and a LOT of water, so it’s just not possible in this type of product, so this is a very tenuous negative – but it’s something that crossed my mind when I was waiting for it to arrive – would it be possible to power wash my patio?. Answer: No. But an unsurprising no! It is powerful enough to get rid of dirt on bikes, cars etc… though. Just as you would expect with this product, when it’s full of water it’s heavy. It’s just worth considering when you have to move it around. WHO WOULD BENEFIT FROM THE FONTUS? WHERE CAN YOU BUY A FONTUS? You can get this product from loads of places, but at present the best place I can find it is Amazon. To find out more (and to read the reviews) then just CLICK HERE. And that’s it! 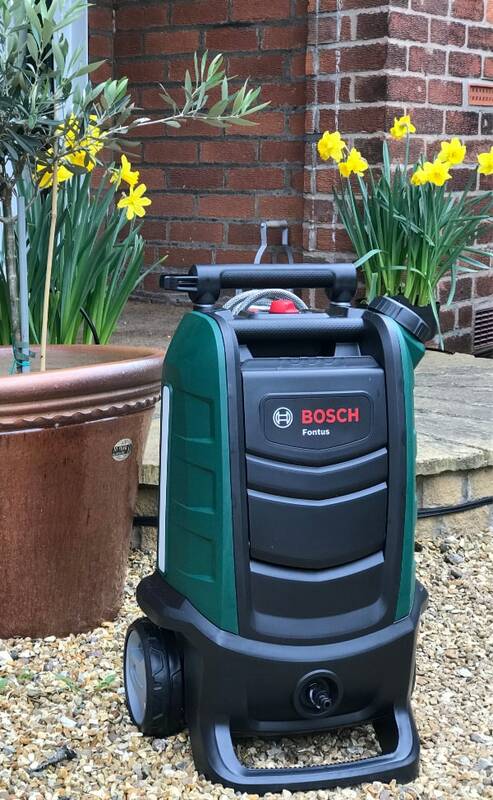 My Bosch Fontus Review. I hope this has given you a good insight into what it’s like, how it can be used, and all it’s benefits. 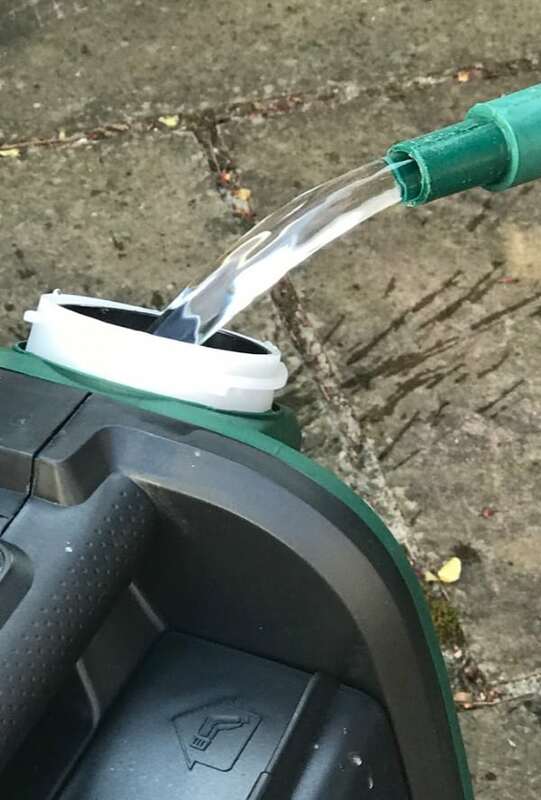 We are using it regularly at the front of our house now, but also for the back because it’s so easy to grab and clean the garden furniture at the bottom of the garden, and water the plants when the weather gets hot – rather than having to stretch the hose to the farthest it can go! I can’t wait to hear what you think about this product, and what you would use it for – so please leave your comments below….